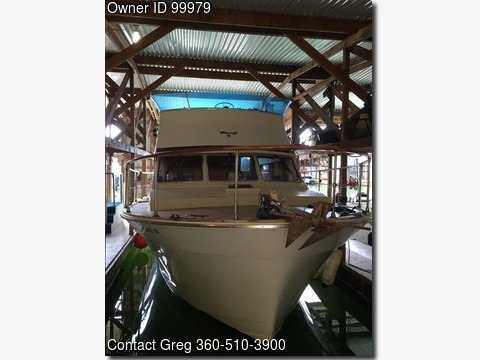 Boat is located in Bellingham,Washington.Please contact the owner @ 360-510-3900 or 123gford@gmail.com...3-Zone Hurricane Hydronic Diesel Heater. Blue Seas 110 and 12 Volt Panels. Seawise Davit System with hypalon Caribe RIB tender15 hp Honda outboard. 5KW Northern Lights generator. Boathouse kept for past 10 years and kept indoors for 9 monthsyear for prior life of the boat. Lowrance 8200C Chart Plotter with NMEA 2000 Trunk Installed. Plath Windlass 300 feet chain 440 gallons of fuel. New aft fuel tanks new fuel manifold, fuel hoses and fuel polishing system Double Racor fuel filters Danfortth anchor. SH P2 Autopilot with Bridge Remote New 100 amp alternators with Centerfielder regulator system Northern Lights 5kw generator with sound shield new engine exhaust risers and engine heat exchangers serviced in 2012. Boat hauled and bottom painted rudder mounts replaced 2015.